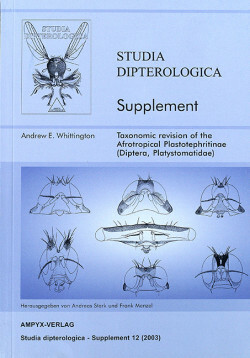 The Plastotephritinae represent a small, but distinctive subfamily of Platystomatidae (Diptera). The Afrotropical genera and species are revised, including material from 26 international collections. The revision is based exclusively on adult morphology, because other life stages are not known for Plastotephritinae. The Afrotropical taxa constitute approximately three-quarters of the subfamily (16 genera; 78 species). An historical résumé provides background and chronological lists of the binomina preceding this revision are given. The phylogenetic position and chracterisation of the Platystomatidae and Plastotephritinae are discussed and the morphology of adult characters is reviewed. The Afrotropical genera are revised from 11 to 16 and a generic key including Afrotropical and Oriental genera is provided. Six new genera are described, ohne genus is newly re-instated and two genera are synonymised. Within each generic revision there is a key to all Afrotropical species. Of the total of 78 species, 45 are newly described and the remainder re-described. Five new specific synonyms are proposed. Twelve new combinations are established and 8 lectotypes are designated. A new catalogue of species is provided, listing in detail all names, name combinations, synonyms, type species, type depositories and locations.